© Jasmine Sparks 2017. All Rights Reserved. Available from Amazon, just click on the book cover and start enjoying right away. Welcome to Jasmine Sparks’ official website. 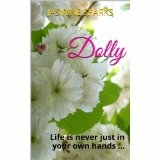 Jasmine Sparks is the pen name of the author of the Dolly Series of novels - Dolly Dolly Series: Book 1 and Paris Connections Dolly Series: Book 2. Dolly and Paris Connections can be found on Amazon. When a man and woman come to claim fourteen-year-old Dolly from a London orphanage in 1917, who are they? What impact will the couple have on her life? A big story full of intrigue, danger, conflict and romance, putting the reader in Dolly’s shoes on every step of her journey. Simple survival is never as ordinary as it seems! If you have read Dolly and Paris Connections, Jasmine would love to hear from you and you can contact Jasmine through the Contact page on this website. You can also share a review on Amazon and Like her Facebook pages: /AuthorJasmineSparks /DollybyJasmineSparks /ParisConnectionsByJasmineSparks. You can catch up with Jasmine on Twitter and Instagram, too.